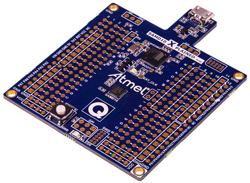 The ATSAME54MOTOR is an MCU card for Motor control starter kit - ATSAMxxxBDLCxxx-STK. 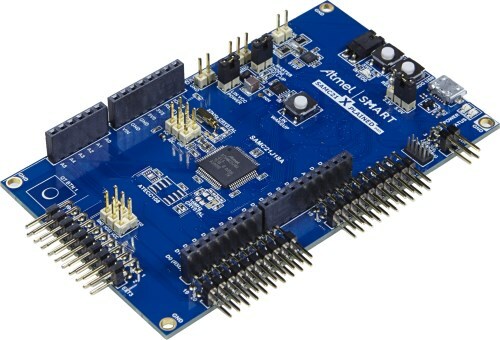 The hardware has the SMART ARM based MCU, ATSAME54, with integrated on-board debug support. 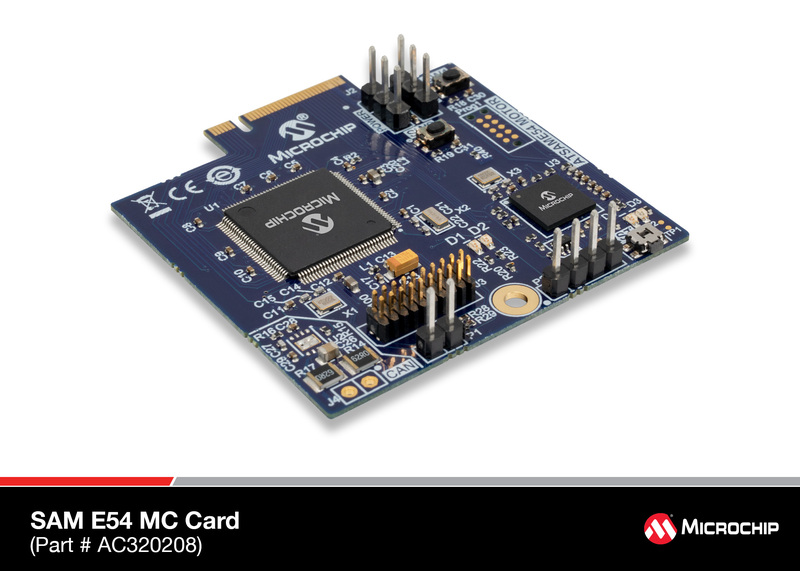 The MCU card can be directly used with the currently available ATSAMD21BLDC24V-STK, a low voltage BLDC, PMSM motor control starter kit. 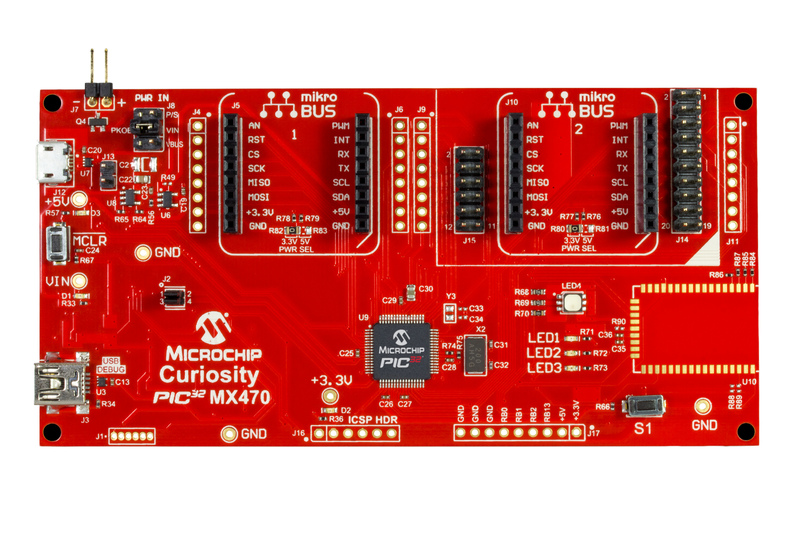 The Curiosity PIC32 MX470 Development Board features PIC32MX Series (PIC32MX470512H) with a 120MHz CPU, 512KB Flash, 128KB RAM , Full Speed USB and multiple expansion options. 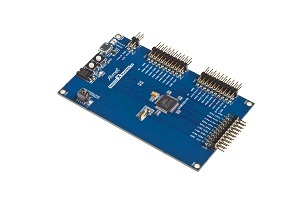 It is an excellent development board for Audio, USB and Bluetooth® Applications. 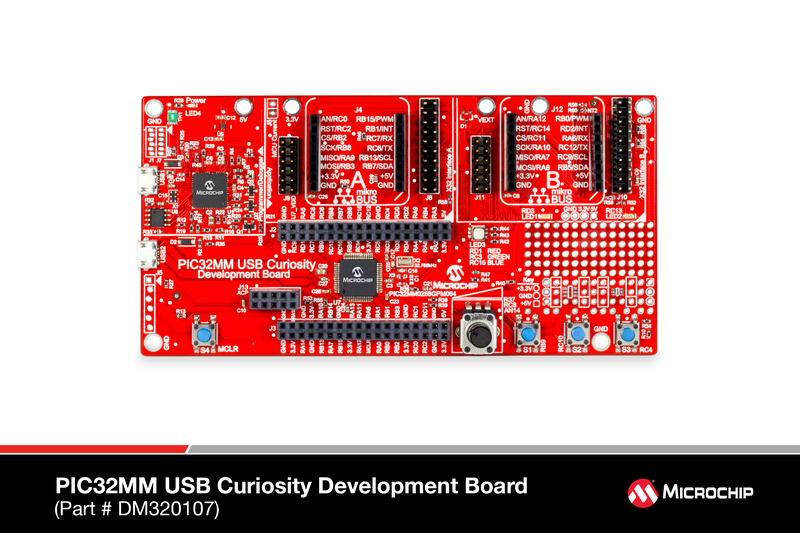 The Curiosity Development Board includes an integrated programmer/debugger, excellent user experience options with Multiple LED’s, RGB LED and a switch. 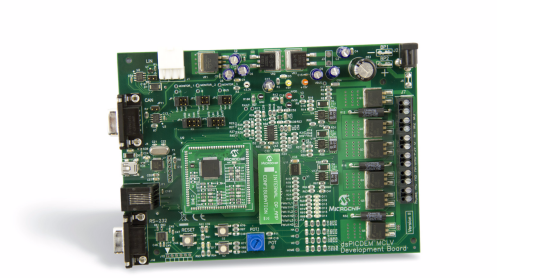 Each board provides two MikroBus® expansion sockets from MicroElektronika , I/O expansion header and a Microchip X32 header to enable customers seeking accelerated application prototype development. 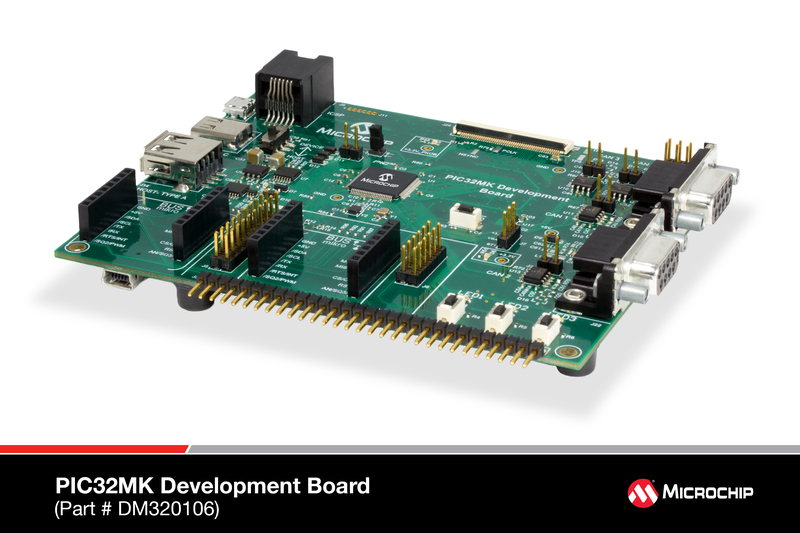 The Board also includes the footprint for BM64 Bluetooth Module which is a Fully-certified, embedded 2.4 GHz Bluetooth® version 4.2 module that Supports Bluetooth BDR/EDR/BLE specification. 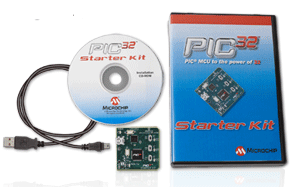 The Board is fully integrated with Microchip’s MPLAB® X IDE and into PIC32’s powerful software framework, MPLAB ® Harmony that a provides flexible and modular interface to application development, a rich set of inter-operable software stack (TCP-IP, USB) and easy to use features. 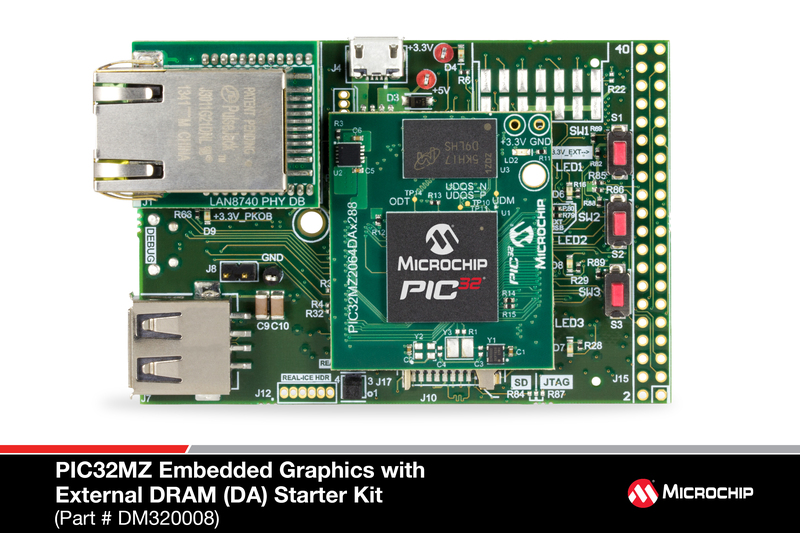 The PIC32MK GP Development Kit - DM320106 - offers a low cost solution for developers looking to build projects with the PIC32MK series of devices, featuring a rich assortment of CAN, USB, ADC and GPIO type inputs. 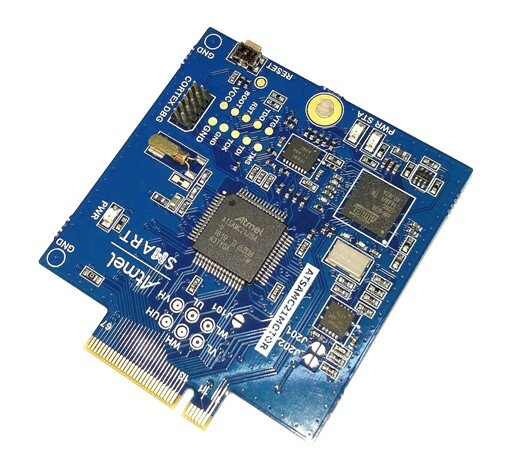 This board also includes a Soloman Systec SSD1963 graphics driver and 30-Pin connector to enable graphics applications with available LCD panels. Today, LED lighting meets the need for energy-efficient lighting solutions and is well poised for a varied number of general purpose and industrial applications such as consumer lighting, solar powered lighting and more. 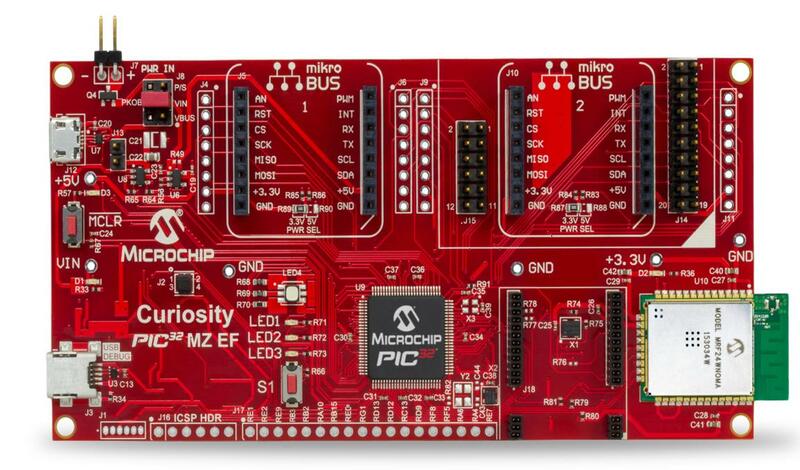 The LED Flashlight Board is based on Microchip’s eXtreme Low Power (XLP) and the cost-effective PIC32MM “GPL” family of microcontrollers. 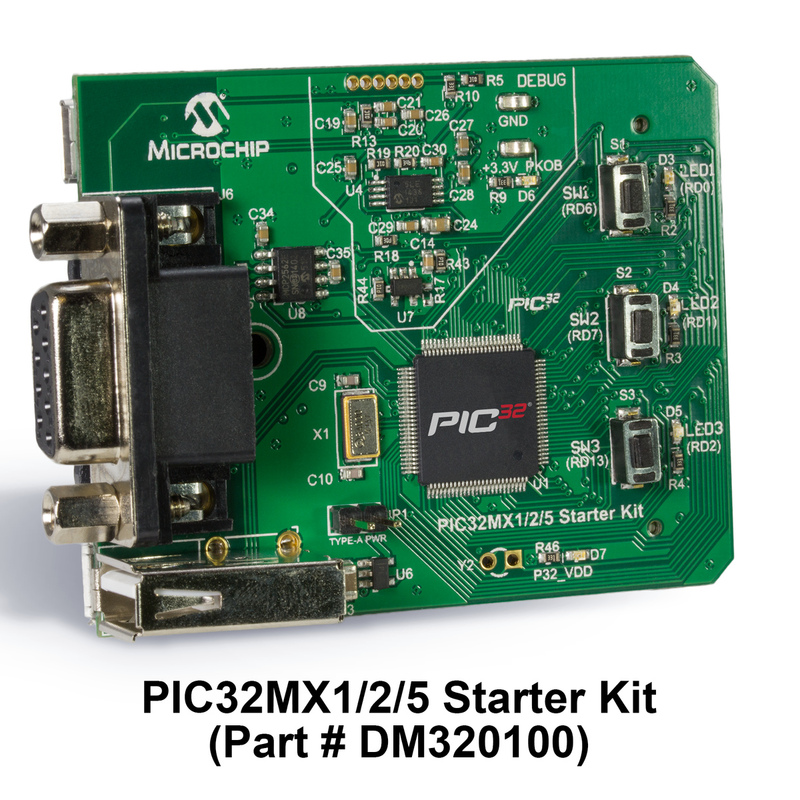 For applications demanding low power, longer battery life and small form factor, the PIC32MM devices offer sleep modes down to 500 nA and packages as small as 4×4 mm. 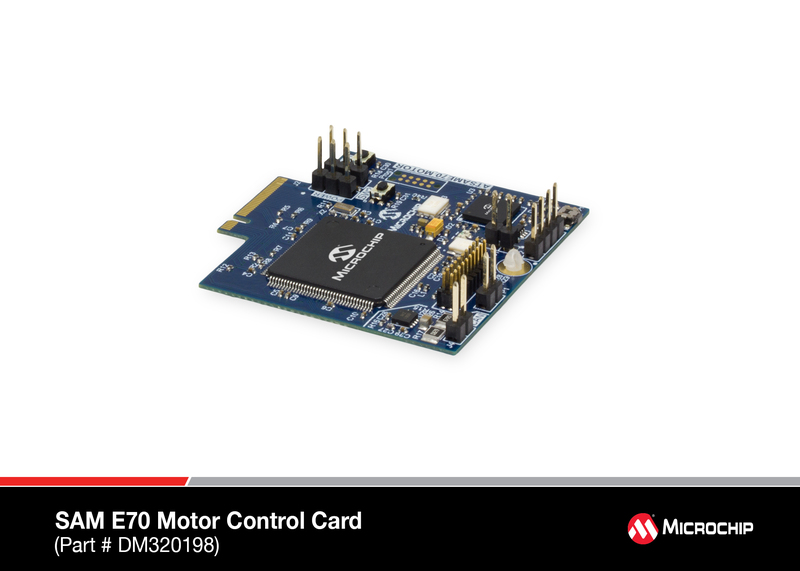 This family features Core Independent Peripherals (CIPs) such as Comparators and Multiple-output Capture Compare PWMs (MCCPs) which help enable power conversion and motor control applications. 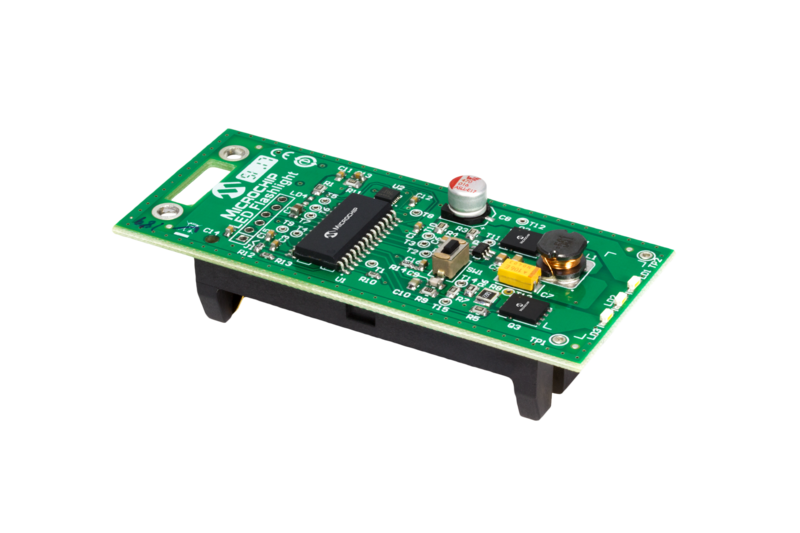 The LED Flashlight board demonstrates the powerful PIC32MM0064GPL028 XLP microcontroller featuring up to 64 KB ECC flash and 8 KB of RAM and is ideally suited to implement an entry level digital power application. 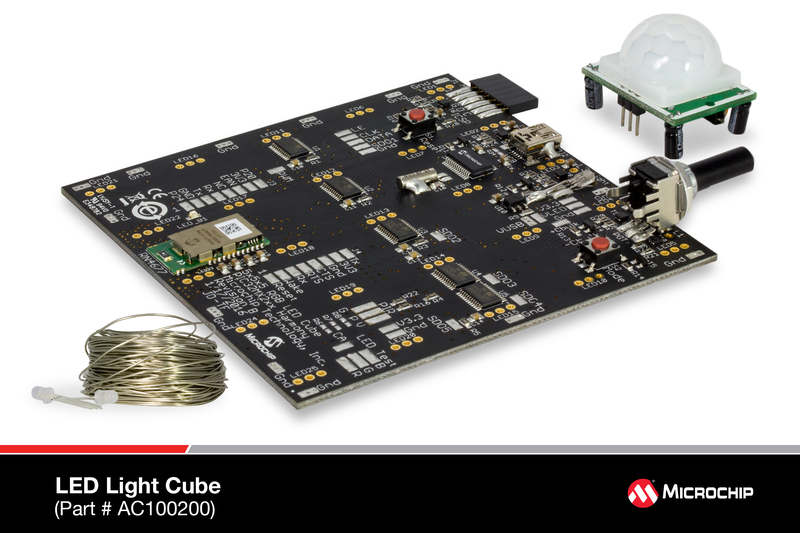 The layout and external connections of the LED Flashlight demo board offer unparalleled access to the CIPs such as Comparators and MCCP that are designed to offload the CPU to be in power saving mode, thereby enabling longer battery life. 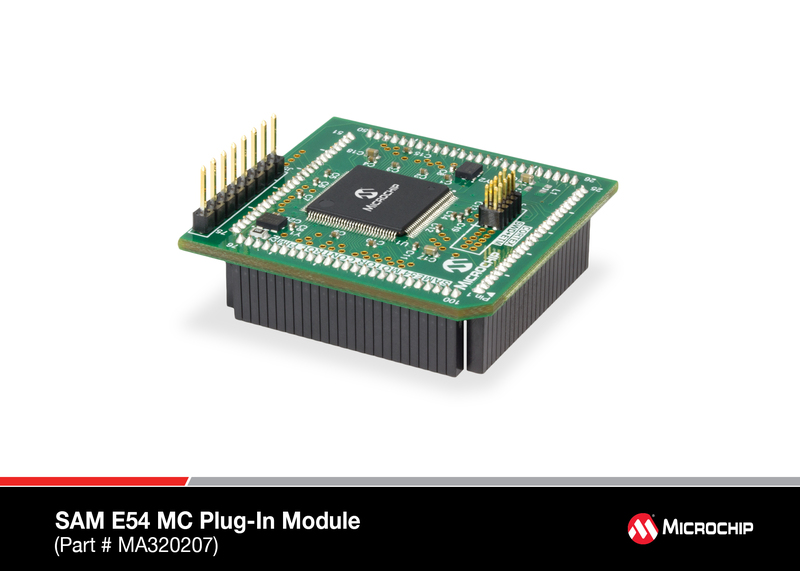 These CIPs enable the user to integrate various system functions onto a single MCU, simplifying the design and keeping system power consumption low. 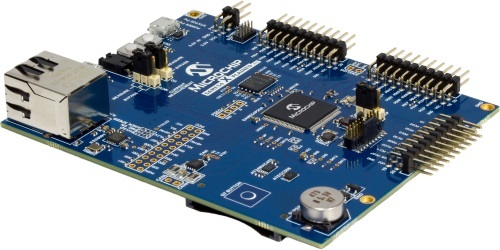 Owing to a higher flash size up to 64 KB, a communication stack can be easily implemented. 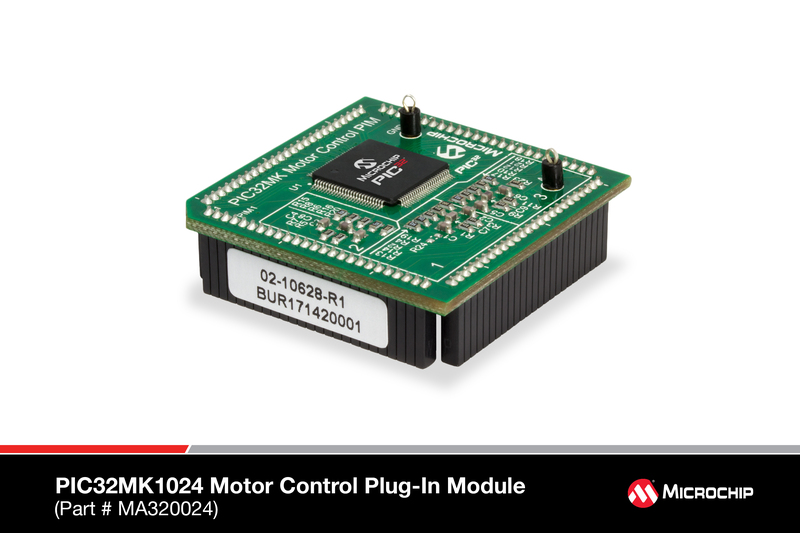 In this demo, flash size of 32 KB is used to implement the motion sensor calibration stack, leaving additional room to implement other functions. 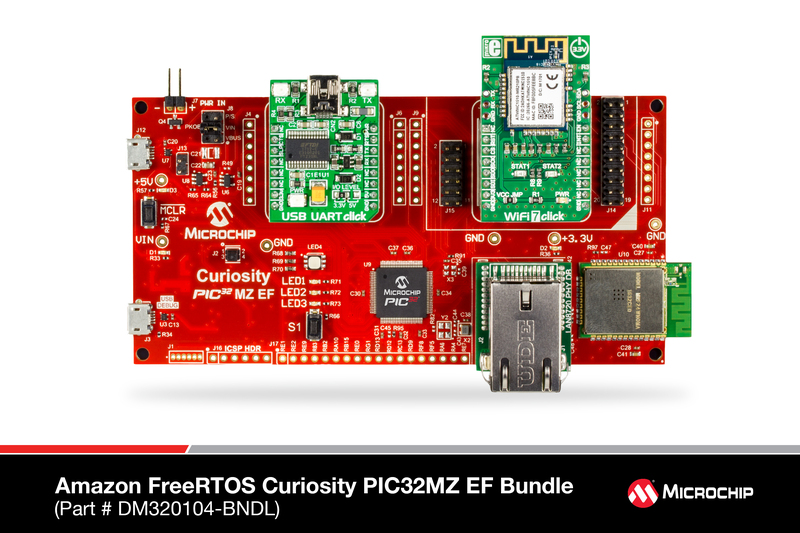 The PIC32MM USB Curiosity Development Board features the new eXtreme Low Power (XLP), PIC32MM “GPM” family (PIC32MM0256GPM064) of low cost microcontrollers. 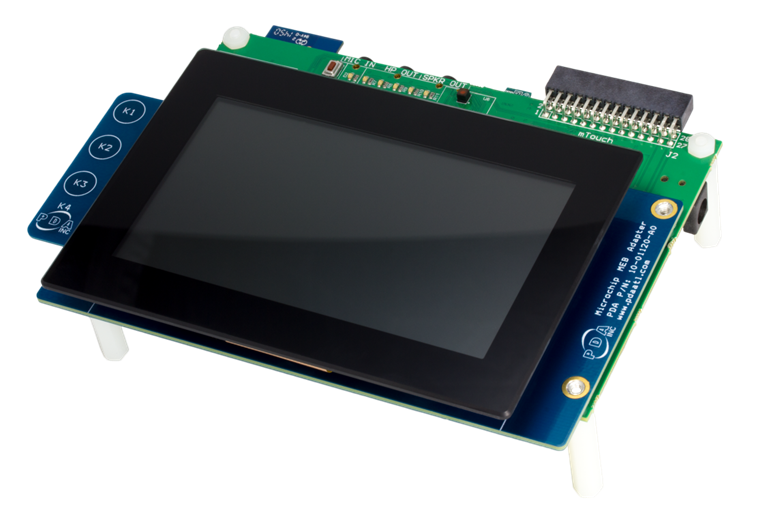 This board is a simple and easy to use platform that facilitates quick PIC32MM GPM evaluation, experimentation and application prototyping. 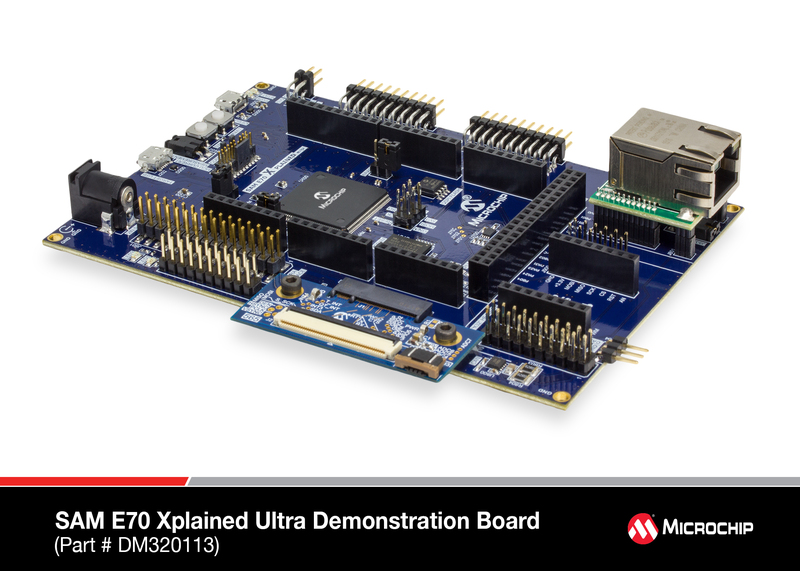 The board also includes an integrated programmer/debugger and offers seamless integration with Microchip’s MPLAB® Code Configurator, MPLAB® Xpress Cloud-based IDE and MPLAB® X IDE for easy set-up and development. 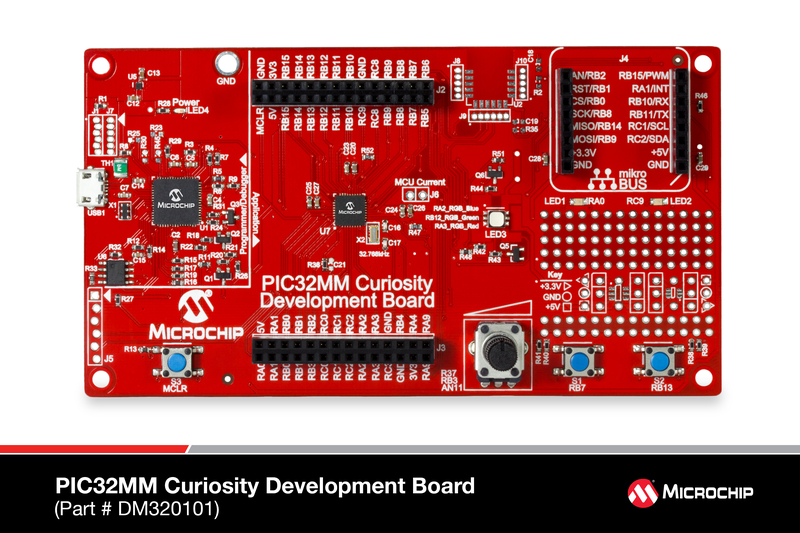 The PIC32MM USB Curiosity Development Board features 2 MikroElektronika mikroBUS™ expansion interfaces that gives the user access to over 300+ add-on click boards™, USB micro B connector and two X32 Interfaces that facilitates access to the PIC32 Audio Codec Daughter Card making this an ideal evaluation board for Audio noise cancellation, USB headphones, Hi-Resolution audio, Bluetooth audio and other general purpose applications. 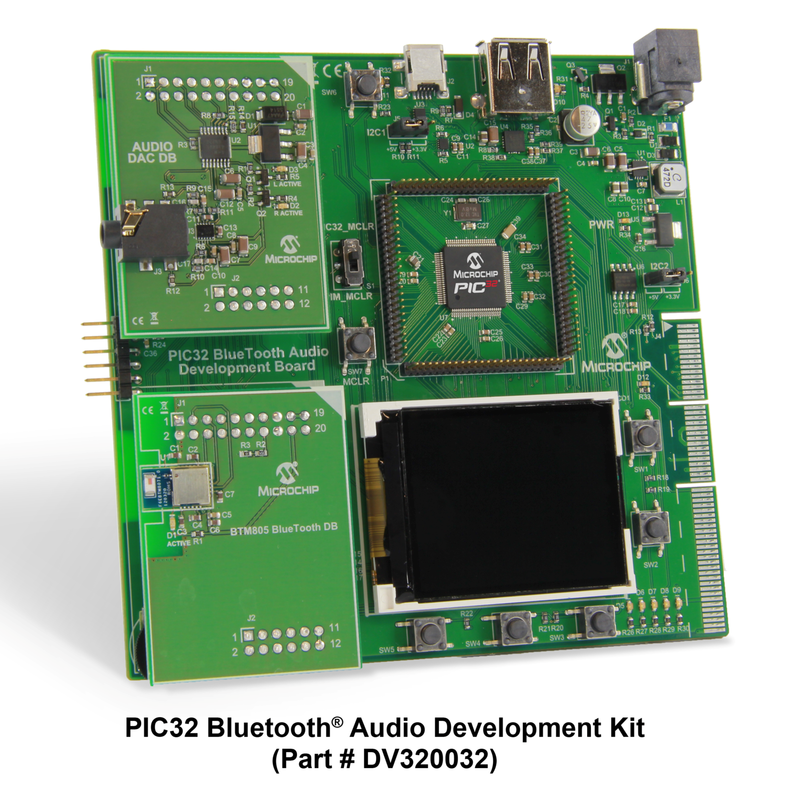 For customers who want to develop USB audio applications with the PIC32MM GPM family, the USB audio headset demo is a perfect starting point that leverages the X32 headers populated on the PIC32MM USB Curiosity Development Board. 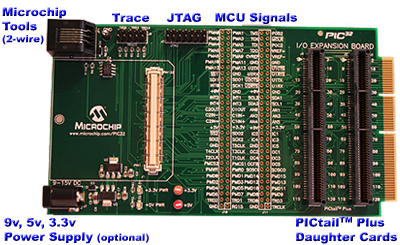 Implements an HID audio control interface for digitally adjusting volume/pause/play, etc. 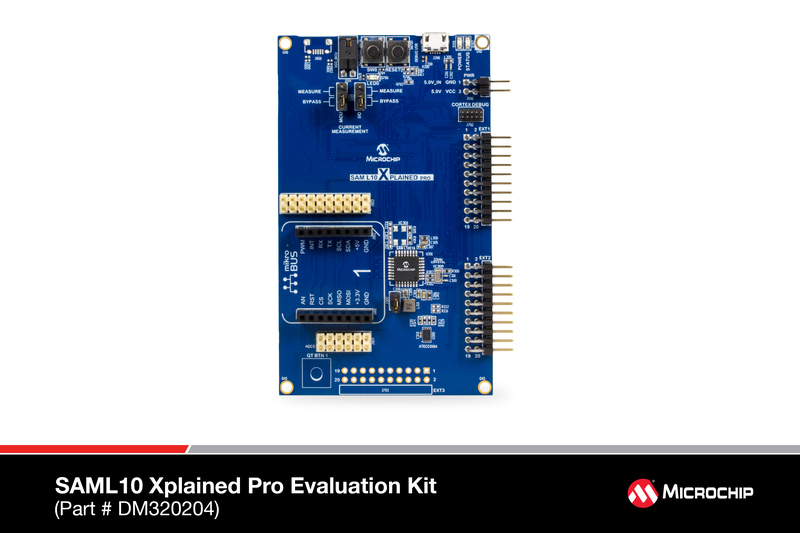 SAM D20 Xplained Pro supports many Xplained Pro extension kits, including I/O1 Xplained Pro, OLED1 Xplained Pro, and PROTO1 Xplained Pro. 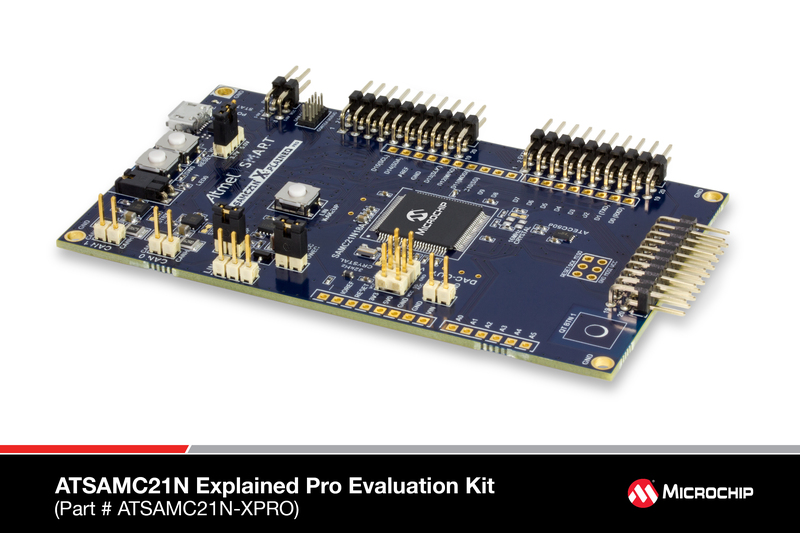 The SAMC21N Xplained Pro evaluation kit is a hardware platform for evaluating the ATSAMC21N18A microcontroller (MCU). 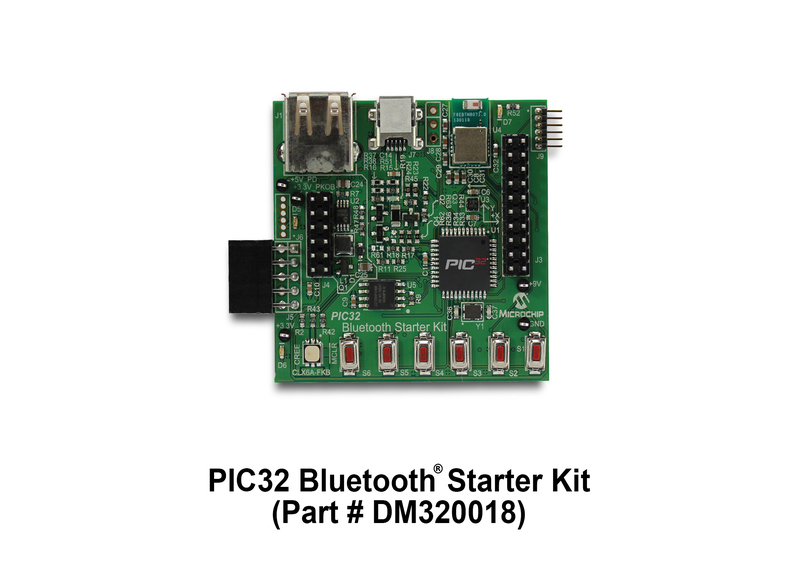 Supported by the Studio integrated development platform, the kit provides easy access to the features of the ATSAMC21N18A and explains how to integrate the device into a custom design. 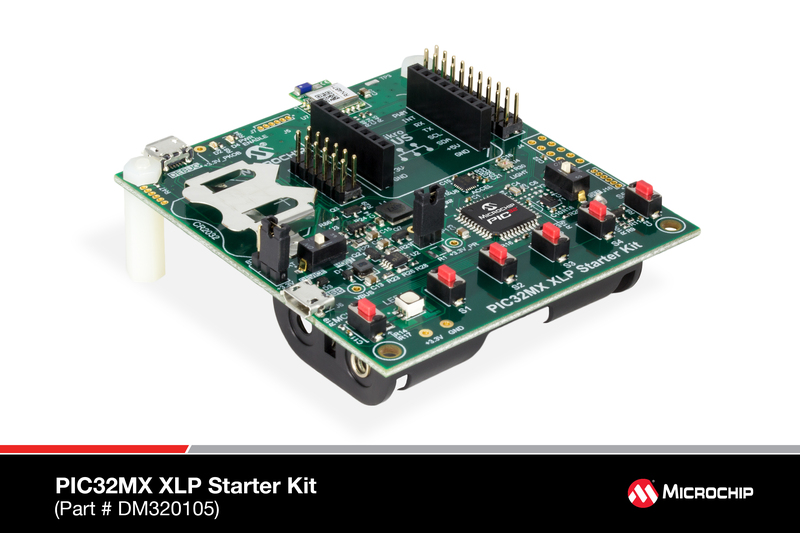 The Xplained Pro MCU series evaluation kits include an on-board Embedded Debugger, eliminating the need for external tools to program or debug the ATSAMC21N18A. 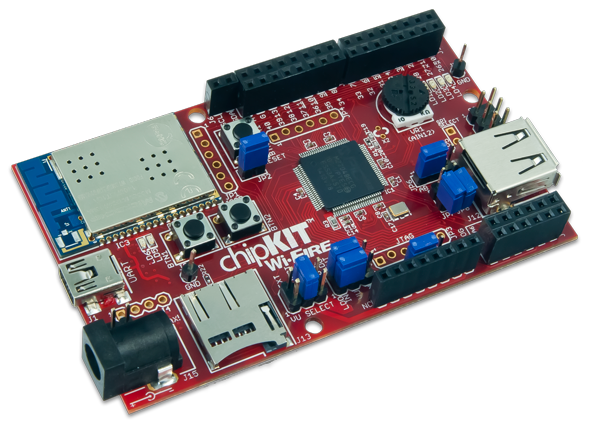 The kits offers additional peripherals to extend the features of the board and ease the development of custom designs. 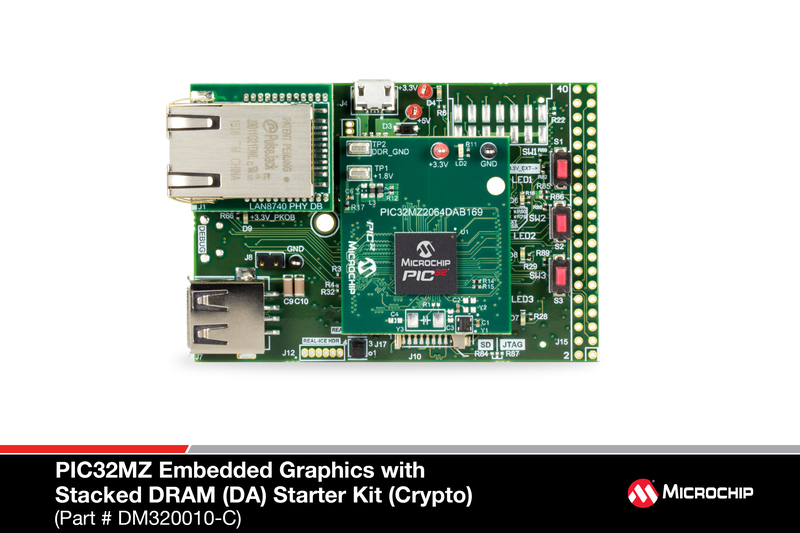 The kit is supported by various demo examples which includes water tolerant touch, keypad touch, low power weather station and SleepWalking demos. 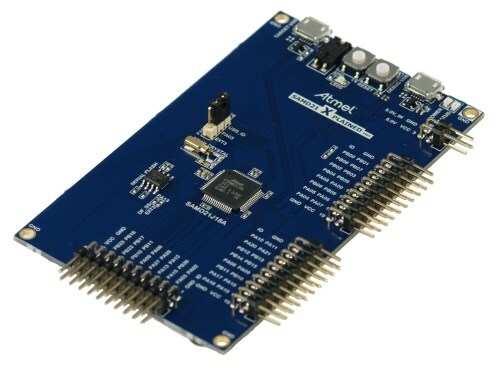 It has microBUS socket and Xplained Pro extension headers to expand the development with Mikroelektronika click boards and Xplained Pro extension kits.The kit includes an on-board Embedded Debugger, eliminating the need for external tools to program or debug. 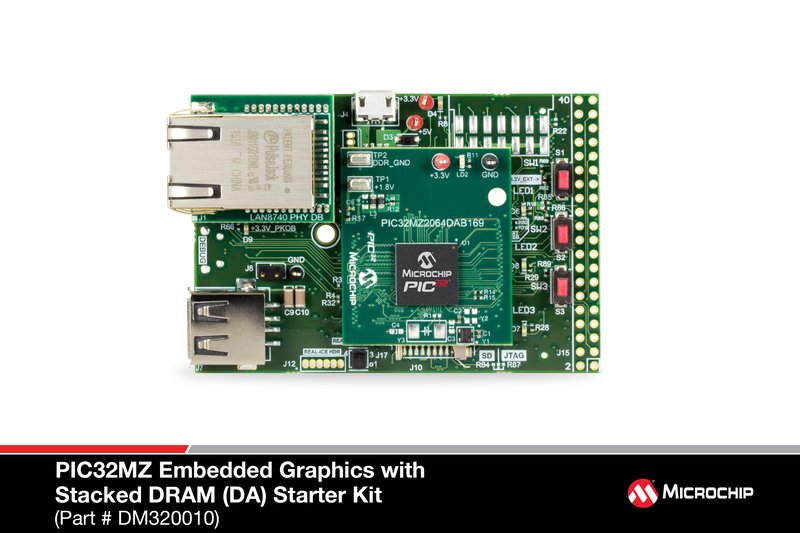 The kit also has Xplained Pro Analog Module(XAM) that can be used with the Data Visualizer tool to monitor and analyze power consumption in real time. 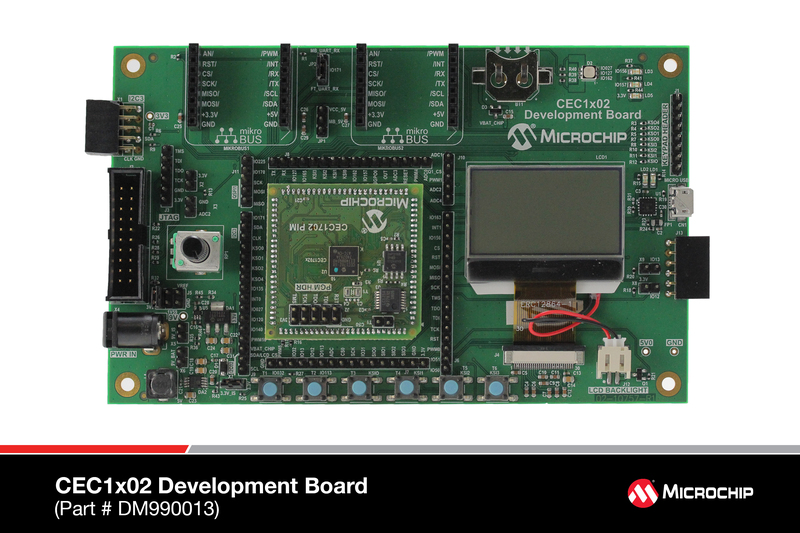 Microchip’s DM182023 development kit gives embedded software developers access to a comprehensive set of open source tools for use with Exosite’s advanced cloud-based IoT PLATFORM, enabling them to fast-track their IoT initiatives. 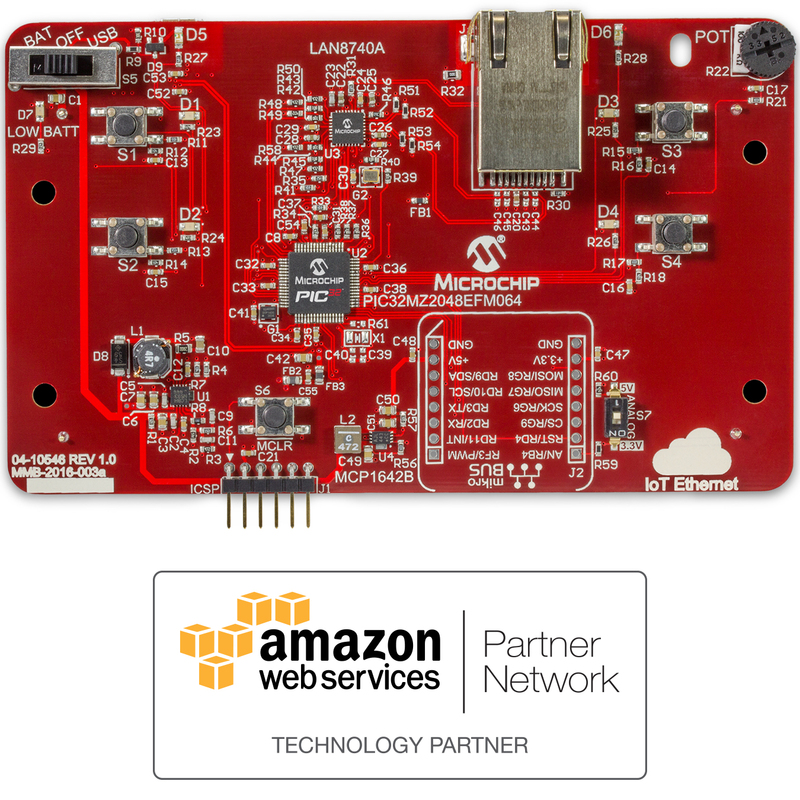 The connectivity the Exosite IoT platform is ensured by an MRF24WG0 Wi-Fi module, agency certified IEEE 802.11 b/g Wi-Fi radio transceiver module. 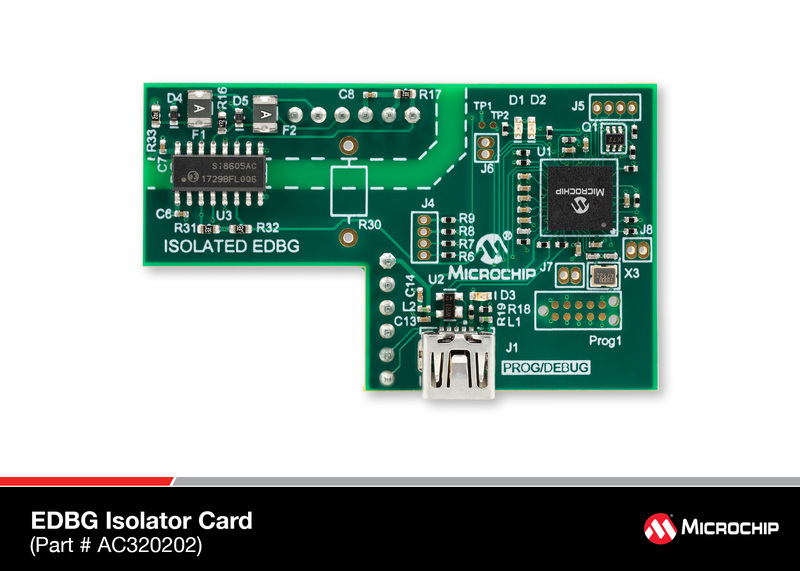 The MRF24WG0MA has an integrated PCB antenna, matching circuitry, and supports Wi-Fi with the free TCP/IP protocol stack. 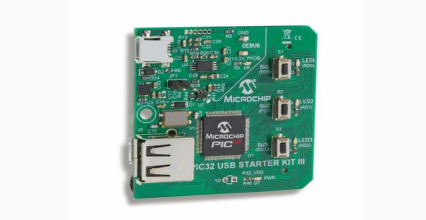 The micro-controller at the heart of this kit is a PI32MX 32-bit controller. 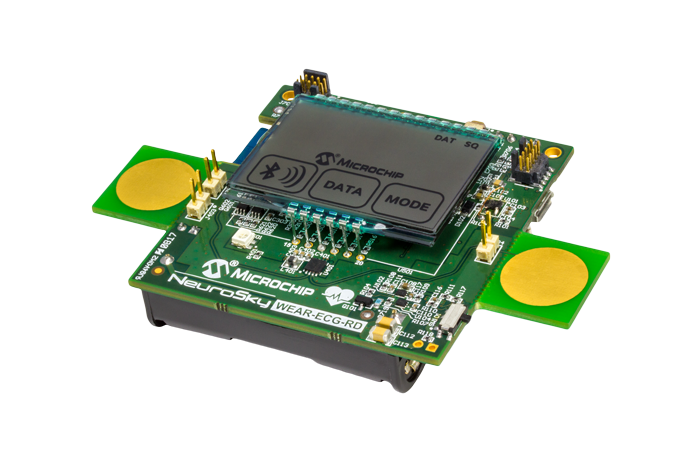 The Microchip WCM is the first product to be certified as ExositeReady™ which certifies that a production ready port of the ExositeReady™ Embedded SDK is available and ready for use in your application.